In June 2017, a whale made a few very lucky people millionaires (and cost a lot of people a lot of money) by dumping 35,000 Ether on the market in one go, which caused the price of Ethereum to fall from $318 to $0,10 in less than a second. This week Twitter user Ardon Lukasiewicz shared the live footage of that event. The Ethereum drop occured on the GDAX exchange, now Coinbase Pro. Because of the huge sell order, a number of orders were being filled from $317.81 to $224.48. As a result, another 800 stop loss orders were triggered, leading to the price dropping all the way to $0,10, where some lucky buyers had their orders waiting for the day Ethereum dropped all the way to the bottom. Within no time, the price of Ethereum bounced back to $300, giving the $0,10 buyers instant gains of 300,000%. On the other hand, a lot of traders got rekt because their stop loss orders were triggered on the way down, while the price went back to normal levels within a few seconds. 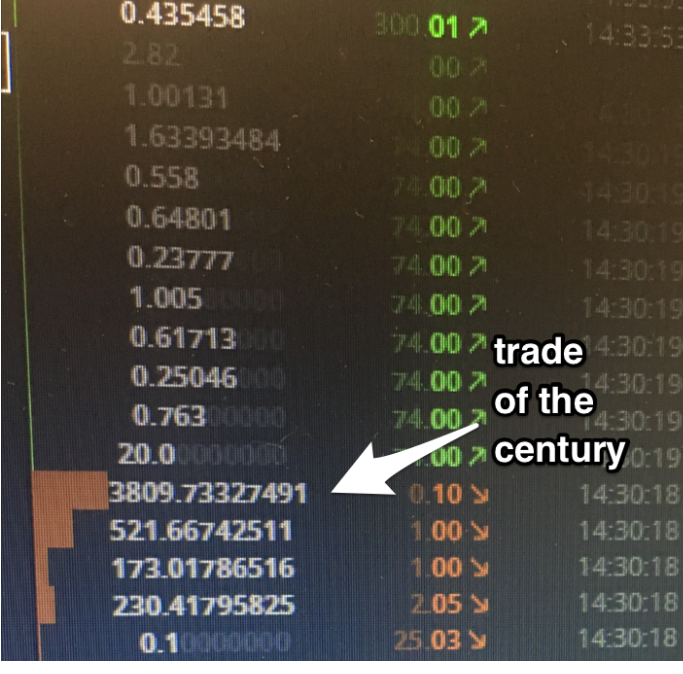 As you see in the video, one trader had a buy order of over 80K ETH ready at $0,10, but just before his order was triggered, the price bounced back. Another trader managed to buy 3,809 Ether (now about $670,000) for $0,10 per Ether. After the flash crash, GDAX reimbursed traders that lost money during the event. The lucky traders got to keep their money.